Here they come. Hollywood is currently half a dozen or so foreign language hit films in English. “Gloria Bell” is the Americanized version of director Sebastián Lelio’s 2013 film “Gloria.” Why an up and coming director would want to revisit something he has already seemingly accomplished is beyond my understanding. “Gloria Bell” debuted at the Toronto Film Festival in 2018 to pretty good reviews. It was bought by Oscar-winning studio A24 which set an early Spring 2019 release date. The story follows a middle-aged, Los Angeles woman just going through the mundane motions of life. The screenplay makes no attempt to get the audience to warm up to this woman, who is interested in everything she encounters, yet neither succeeds nor masters anything. We first find Gloria Bell (Moore) enjoying a night at a local LA dance club, dancing to 80s music in a room full of 50-somethings. “When the world blows up, I hope to go down dancing,” Bell says later in a conversation with her friends. Her carefree attitude has led to her divorce and two children who are either cursed/blessed with their mother’s lack of commitment in their own lives. On one of her regular club outings, Bell meets Arnold (Turturro), who is not the kind of guy this beautiful woman, always complimented for her stunning hair and natural looking face), typically goes for. However Arnold falls quick for the carefree Bell. Their relationship is quickly burdened by problems surrounding both of their failed first marriages. What Lelio and Moore offer here is repellent both in its banality and it’s obscurity. 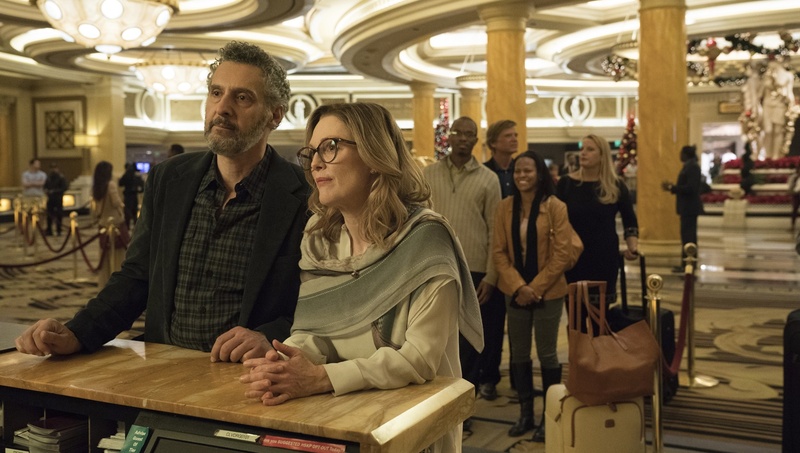 If you don’t already have a negative opinion of people living in Los Angeles, “Gloria Bell” is determined to give you one. Whether his intention of not, Lelio delivers a woman who is in every way “that lady” that annoys everyone with her clinginess to her children and her annoying interest in one thing one moment that quickly fades when the next “moment” arrives. In one scene, Bell spoils a family dinner by discussing personal issues in front of the extended family. Her apology is as weak as the carelessness in which she delivered it. The scene internally reads, “Oh, you all didn’t know. Well I did, and there you have it, I have delivered it, let’s process this information, and move forward.” Yes, Moore performance and facial acting convey all that without having it put to words. If you saw Nicole Holofcenter’s “Enough Said,” you know what an expert version of the modern day, divorced, middle-aged woman living in Los Angeles looks like. “Enough Said” and Julia Louis-Dreyfus performance brings the audience into that character’s world in a way that’s both rewarding and charming. What Lelio and Moore offer here is repellent both in its banality and it’s obscurity. The film doesn’t even run two hours, but the way it’s shot and edited, draws out what little story there is for what seems an eternity. “Gloria Bell” doesn’t have much to tell the audience aside from, “This is your life, do what you want with it,” even if your greatest achievement is losing yourself on the dance floor. You would have to work hard to find a more discardable Julianne Moore performance.